Supporters of Palestine outnumber Zionists at Chicago Israeli Consulate protest | Fight Back! 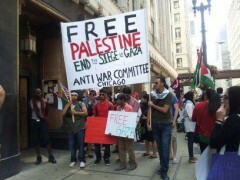 Chicago, IL - Hundreds of protesters stood across the street from the Israeli consulate here, July 22, shouting, “Hey, Israel, waddya say? How many kids did you kill today?” They aimed their voices at a smaller crowd that waived Israeli flags and who gathered directly in front of the consulate in a show of support for the murderous assault on Gaza over the past two weeks. Women leaders of Students for Justice in Palestine-Chicago led most of the rally’s chants. After the Zionist event dispersed, the youthful protesters took off on a march across the Loop to the Chicago Tribune building. They held a die-in there to dramatize that Palestinians in Gaza are still dying under the guns, bombs and missiles of the Israeli attack. For the Palestinian community in Chicago and the solidarity movement, Chicago won’t be quiet until the U.S.-backed siege of Gaza is over.